If you're willing to fly with Allegiant Air, they are showing some flights from Bellingham to San Diego for ~$150 CAD roundtrip ($112 USD) including taxes on select fall & winter dates. The flights from Bellingham to San Diego are non-stop. Vancouver (YVR) does not have non-stop flights to San Diego. Be aware that Allegiant Air is an extremely no-frills airlines, which charges extra for everything. 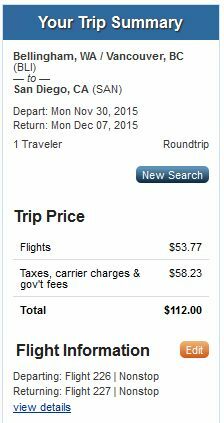 Update 1 - Oct 1 @ 9:14 AM - Dec 7 to 11 has dropped to $132 CAD roundtrip including taxes. Where to stay in San Diego ? The following AirBNB links will lead you to some great deals on places to stay in San Diego for under $99 CAD/night for 2 people. bellingham, bli, california, united states, allegiant air, north america, san diego and san. 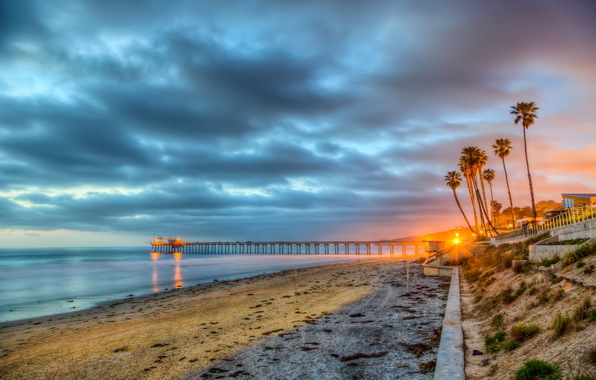 One Response to "Bellingham to San Diego, California - ~$150 CAD roundtrip including taxes"